Posted on October 5, 2014 by revivewa	in Travel and Spirituality and tagged 1, feature. 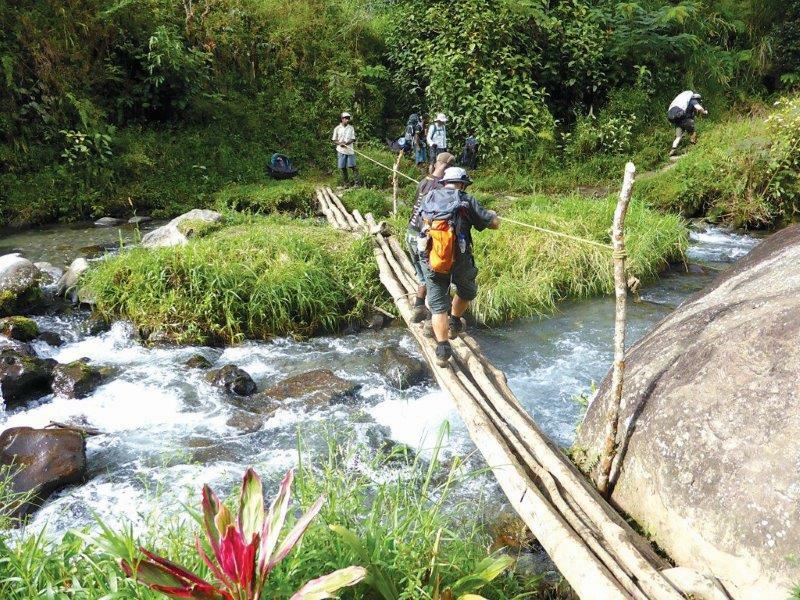 It had long been one of my bucket-list items to trek Kokoda. Not just for the physical and mental challenge of it, not just because of the iconic place it will always have in Australian wartime history, but also because my late father Alan spent over two years in New Guinea during World War II. I’ve been fortunate that God has blessed me with reasonable health and fitness, but as I was approaching 63, I needed to get Kokoda done. So, with my 61-year-old mate Jim Armanasco, who was happy to takeup the challenge as well, we trained for the trek. On 22 May this year, we flew from Perth to Port Moresby to meet our trekking leader Andrew Johnson (AJ) and four other fellow trekkers. We then headed off to our rooms to rearrange our belongings into backpacks and enjoy sleeping in a real bed for the last time for eight nights. After an early morning small plane flight over the daunting looking Owen Stanley ranges to a tiny airport called Popondetta, we were loaded onto a troop-carrier 4WD truck and transported for over two and a half hours across rocky roads, rivers, creeks and mud, before arriving safely in Kokoda Village. We visited the very moving and informative Kokoda Museum and the white monuments perched on the edge of the plateau and were already getting to learn the extent of AJ’s knowledge of, passion and respect for the wartime events on the Kokoda Trail. We then met our local personal porters and cooking porters who all lived at various villages along or near the trail and began our 96km trek with a relatively short, but really tough, steep, slippery, muddy three-hour climb to our first overnight camp site perched high on a hill with spectacular views. After a freezing shower and a basic, but tasty dinner, we slipped into our tents with head-torches affixed to sort out the chaos, blow-up air mattresses and pillows, put purification tablets in our water, take malaria tablets and try to get some sleep – wondering what on earth we’d let ourselves in for. Every morning we’d be up by 5.00am to pack up our tents and backpacks, have breakfast and visit the very basic toilets before trekking off by 6.30am. We’d trek through beautifully coloured rainforest, across and through creeks and rivers, through mud and more mud and quickly came to learn that most of the trail is either steeply up or steeply down with very few level sections, of which some had even deeper, more slippery mud. I often had to tighten laces for fear of the mud sucking my shoes from my feet. As strenuous as the big long climbs were, compounded by the tropical humidity, I actually found the descents more challenging in that they usually required intense concentration to prevent a bad fall (or worse) considering that at times you are right alongside some dangerous drop-offs. Correct placement of your trekking pole, keeping soft knees, taking small steps and making the right decision on your landing point was absolutely critical considering you take big steps down between mossed-over tree roots and rocks in some sections, then slippery clay in others. Sadly, a few trekkers have died in the past through bad falls, cardiac arrest or extreme dehydration. The thing that keeps you mentally tough through these challenges is the sobering thought that in World War II, young, under-prepared soldiers on both sides engaged in extreme jungle warfare in an environment that is difficult enough to walk through with a modest 10kg backpack, let alone with weighty weapons, ammunition, packs and water that they would have had to carry – not to mention the inadequate medicines to avoid or treat malaria, dysentery, wounds etc. The words ‘bravery’ and ‘courage’ seem totally inadequate. AJ spoke about the various aspects of the war campaign at many stages along the trail, playing The Last Post and recordings of old Diggers’ recollections of events. At Isurava and Brigade Hill, he asked me to read out two lengthy poems that my Dad had written during his time in New Guinea which was very moving and emotional for me. The immense beauty of the pristine jungle rainforest, the mountain scenery, and the beautiful friendly nature of the porters and local village people really left an impression on me. The Seventh Day Adventist church has a huge presence in their communities and we enjoyed concerts of lovely Christian songs at the villages of Aola and Kagi. With no electricity anywhere along the track, they are very passionate about their Christianity and seem very content with life. Trekking Kokoda was a privilege and a special bond that Jim and I will always share and I thank God for giving us the motivation, health, ability and luck to experience and complete it unscathed.